Lone Star epitomizes the “great American success story.” The bakery was started in 1889 by a German immigrant who adopted San Antonio as his home. His specialty was bread, which quickly earned a reputation for flavor, freshness and consistent quality. In 1956, the Morris family purchased the growing bakery and today it remains their family business. A changing world and new technologies led the Morris family to expand their horizons and they adopted a new freezing technique, which allowed them to preserve the flavor and freshness of their products. With the new technology, the family began to shift emphasis toward frozen institutional type baking products. 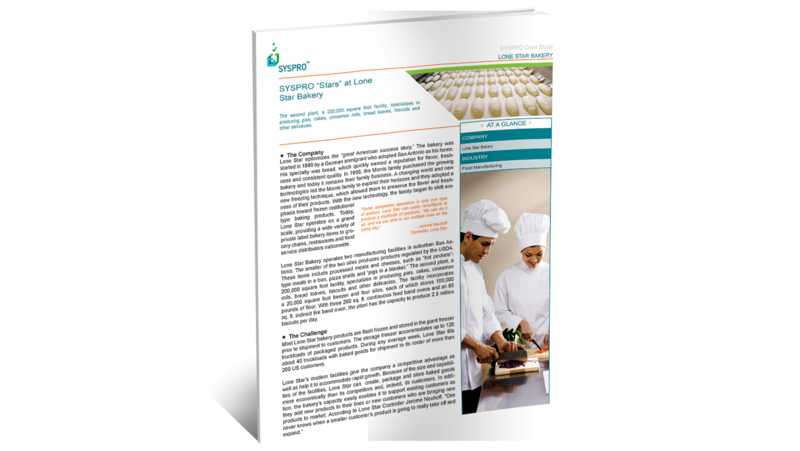 Today, Lone Star operates on a grand scale, providing a wide variety of private label bakery items to grocery chains, restaurants and food service distributors nationwide. Lone Star Bakery operates two manufacturing facilities in suburban San Antonio. The smaller of the two sites produces products regulated by the USDA. These items include processed meats and cheeses, such as “hot pockets”-type meals in a bun, pizza shells and “pigs in a blanket.” The second plant, a 200,000 square foot facility, specializes in producing pies, cakes, cinnamon rolls, bread loaves, biscuits and other delicacies. The facility incorporates a 20,000 square foot freezer and four silos, each of which stores 100,000 pounds of flour. With three 260 sq. ft. continuous feed band ovens and an 80 sq. ft. indirect fire band oven, the plant has the capacity to produce 2.5 million biscuits per day. Most Lone Star bakery products are flash frozen and stored in the giant freezer prior to shipment to customers. The storage freezer accommodates up to 120 truckloads of packaged products. During any average week, Lone Star fills about 40 truckloads with baked goods for shipment to its roster of more than 200 US customers. Another reason for the outstanding success of Lone Star is operational flexibility. Neuhoff explains that Lone Star is not locked into producing one type of baked goods. “While,” he says, “some companies specialize in only one type of product, Lone Star can easily reconfigure to produce a multitude of products. “We can do it all, and we are able to run multiple lines on the same day,” he says. In the mid-nineties, it became apparent to company management that while the company’s facilities were among the most modern in the country, the bakery’s procedures were archaic – all records were kept manually in a set of books. So the company set out to find an integrated accounting/manufacturing software solution that would mirror the progressive nature of its manufacturing operations. Neuhoff joined Lone Star during the software search process and participated in the evaluation phase which eventually resulted in the selection of a SYSPRO ERP solution in 1996. “We chose SYSPRO because we felt it was a better fit for our manufacturing operations, as opposed to the other solutions we reviewed which were too distribution intensive,” he says. Originally SYSPRO was implemented onto a Novell 3.12 network; however, the software now runs on an upgraded Windows 2000 server with 16 concurrent users. Lone Star’s two plants are connected via two point-to-point T1 connections; one for data, one for voice. system,” he states. He points out that the software has enabled Lone Star to operate more economically through tighter inventory controls and the ability to forecast and make more judicious purchasing decisions. massive amounts of inventory – an impressive ability considering Lone Star’s production schedule changes every 24-48 hours.